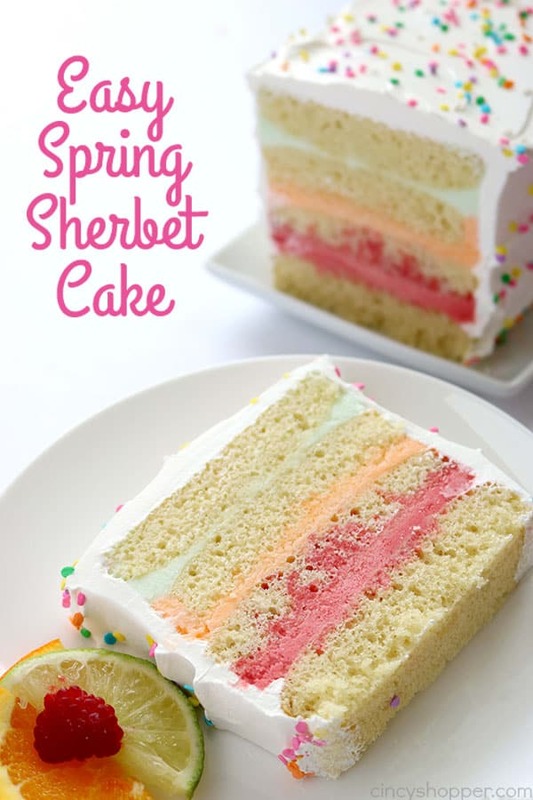 This Easy Spring Sherbet Cake will be great for Easter dessert or spring and summer parties! 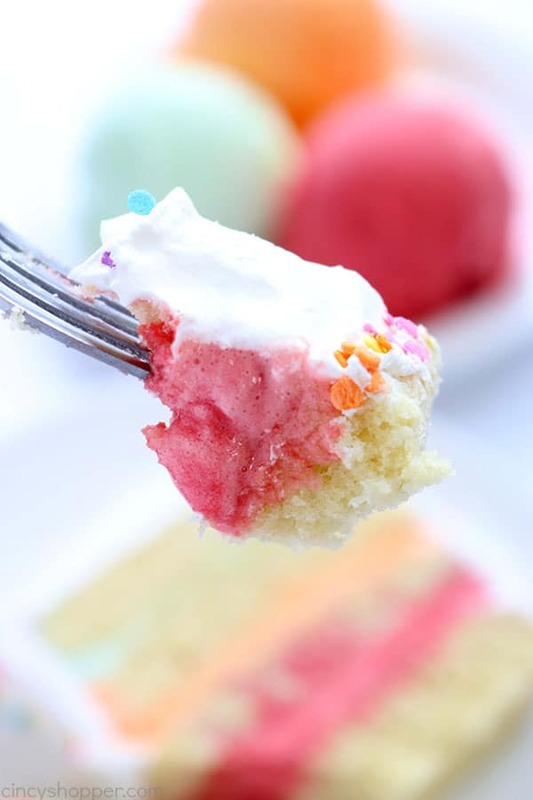 Super simple since we start with a boxed cake mix then layer with refreshing sherbet. Light and delicious! 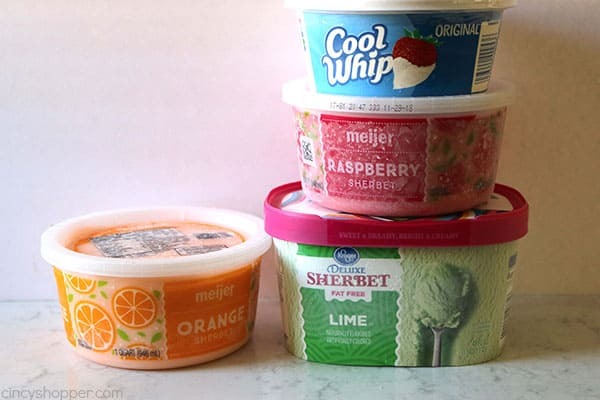 With spring weather and Easter just around the corner, I was looking to make a new simple dessert that will be great for both the holiday and for all the spring and summer bbq’s we will be having. 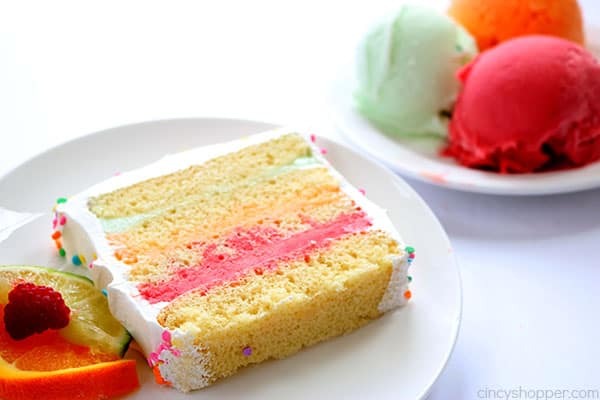 I love colorful and fun desserts. 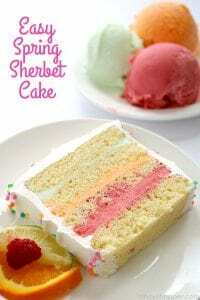 This Sherbet Cake is VERY colorful in person. I plan to make this easy spring cake again for our Easter dessert. 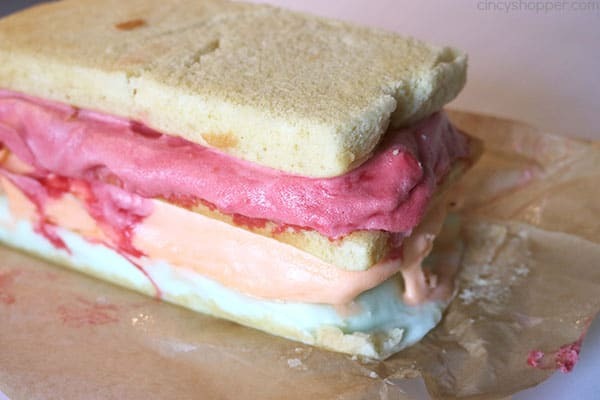 When I make it, I plan to add in a bit more sherbet. I was worried that the layers would be too thick but I could have added in a bit more sherbet and the size would still be perfect. 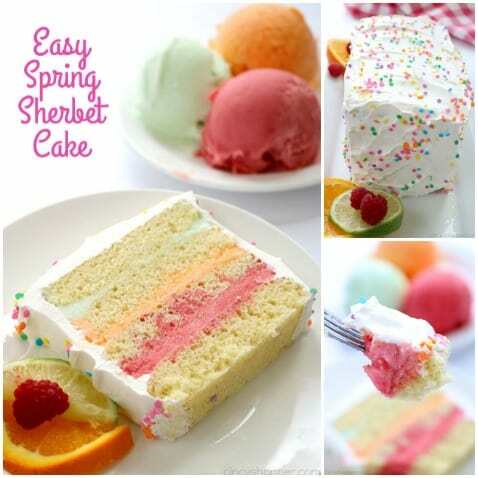 Sherbet is a perfect light and refreshing spring and summer cold treat. 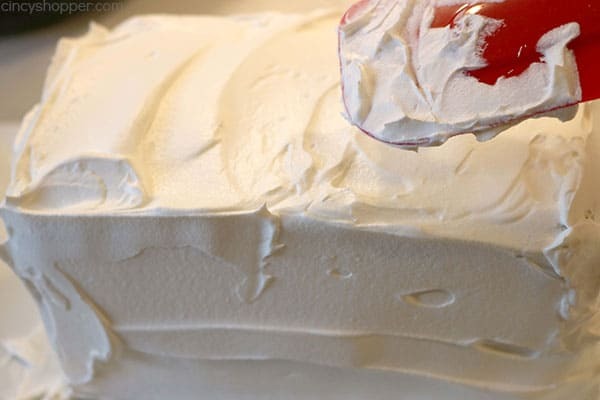 When you add it in with the cake layers and the Cool-Whip, the dessert becomes out of this world AMAZING! I think it would be a great dessert for a baby or wedding shower dessert too! My hubby helped me assemble this cake. He was so anxious to eat it, that’s all he could talk about. He kept saying how good it was going to be. He was 100% right! The cake was delicious and perfect for our after dinner dessert. This is one of those cakes that you will want to keep frozen until about 15 minutes or so before serving. It stays cold for quite awhile if completely frozen. Cut with a sharp knife into slices and you can feed quite a few guests. Please note, I did not include the cake mix and it’s ingredients in the picture below. I started making this recipe as soon as it popped in my head and forgot to snap a full ingredient picture. You will need the cake mix and it’s called for ingredients. 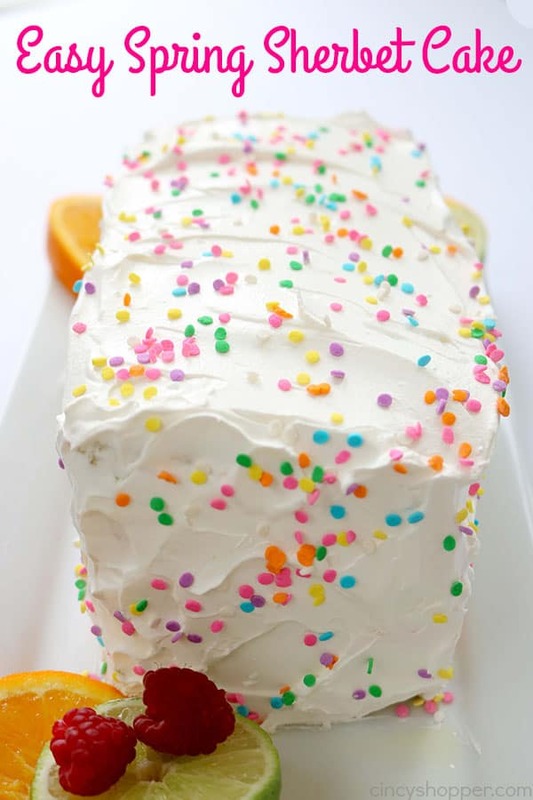 I used a white cake mix but I think it would be great with an angel food cake too. If you are short on time, grab a Sara Lee Frozen angel food cake and slice it into the four layers. I think that would make this recipe even easier. I added on spring Easter Sprinkles to make it look prettier. Obviously the sprinkles are not necessary. Mix cake mix according to box directions. Pour 1 cup of batter in prepared pan. Allow to cool for 5 minutes the remove to cooling rack to finish cooling. Repeat 3 more times (making 4 layers). 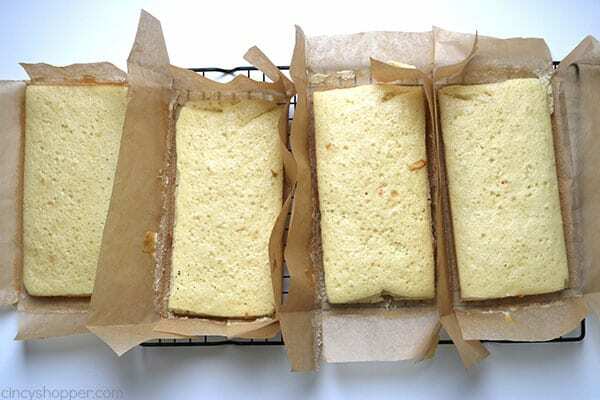 Line cooled loaf pan with parchment paper. 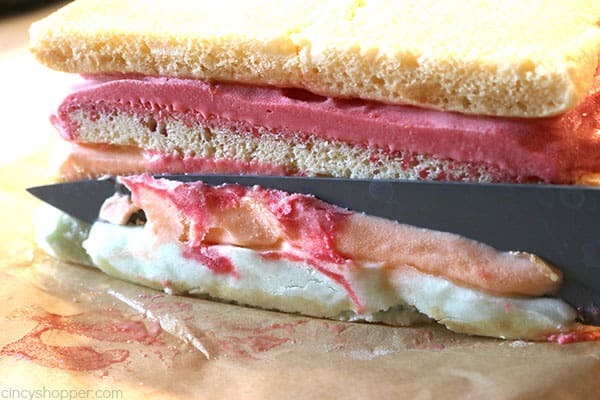 Place 1 layer of cake in pan and evenly spread layer with one flavor of softened sherbet. 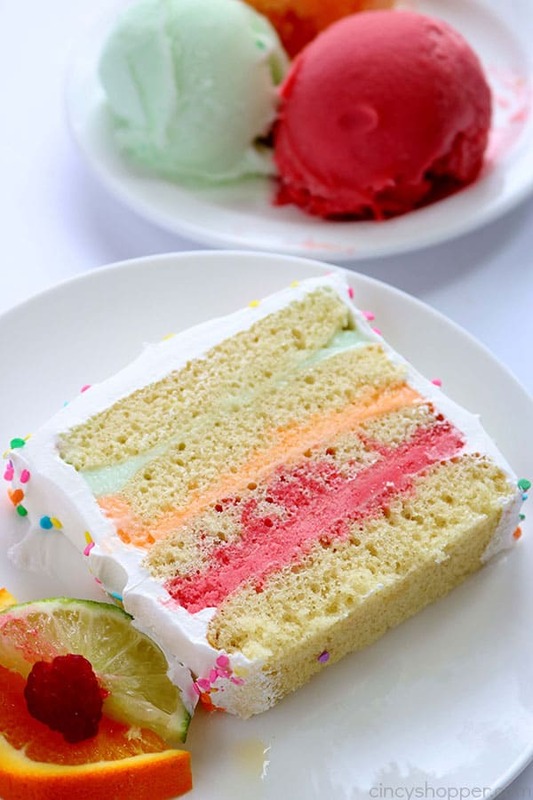 Repeat with 2 more layers of cake and sherbet. 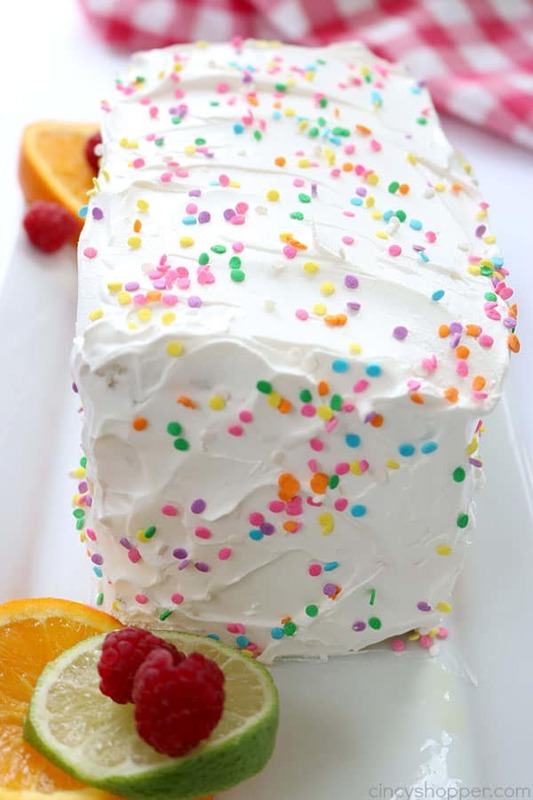 Top with remaining layer of cake. 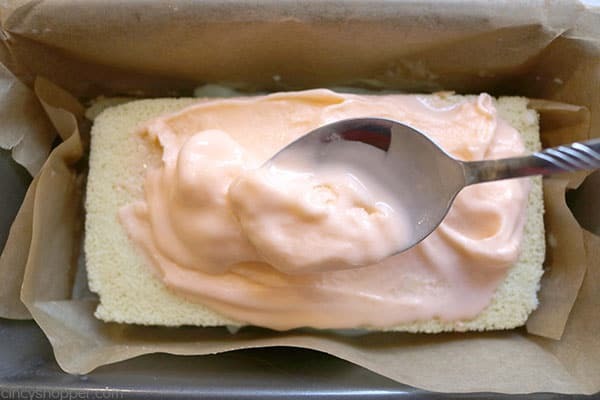 Using a sharp knife, carefully clean up sides of cake to remove overflowed sherbet. Cover top and sides of cake with whipped topping and smooth. Shake sprinkles on top and sides. Do you have a favorite spring dessert? 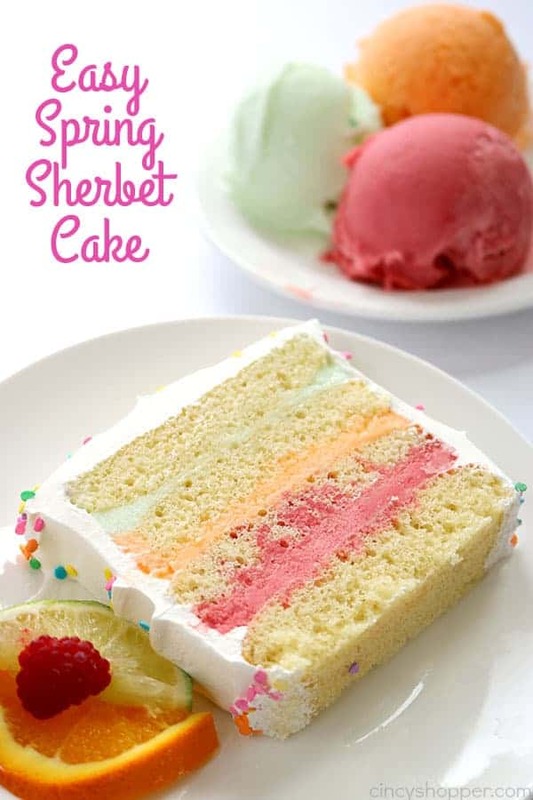 I don’t normally ice cream, but I love sherbet and cake too. Great way to combine the two into an awesome treat. This is definitely something my family would love! As a new co-host for Merry Monday I’ll be sharing on my roundup this week! Can’t wait to see what you link up this week! This looks so yummy! Great photographs AND recipe! Here by way of Inspiration Monday… would love to have you join us at Homestyle Gathering on Tuesday!